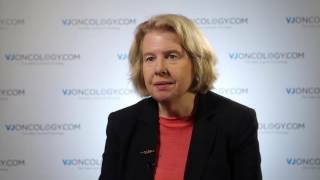 Ursula Matulonis, MD of the Dana-Farber Cancer Institute, Boston, MA talks about the ENGOT-OV16/NOVA trial, a trial of women with relapsed platinum-sensitive high-grade ovarian cancer (NCT01847274). Dr Matulonis explains that this was randomized, double-blinded placebo study; the women were platinum-sensitive and responding to platinum and went on to niraparib versus placebo. They also underewent germline BRCA testing and were grouped into gBRCA and non-gBRCA cohort; in the latter cohort, they were further tested for homologous recombination deficiency (HRD). In all the groups, there was a benefit to receiving niraparib and this is not a suprising result as Dr Matulonis explains.